As the dad of a 1 1/2-year-old, I know that kids can change moods at the drop of a hat. Or at the suggestion of the drop of a hat. Or at the notion that hats exist at all. But that doesn&apos;t mean new experiences aren&apos;t worth trying. So when my family is feeling adventurous, we pack the bag and head to one of these fun, free spots in Columbus. The fact that they&apos;re free takes some of the risk out of the equation. If my kid&apos;s not having a great time, we can easily move on to the next thing. Slate Run Historical Farm - Southeast of Columbus in Canal Winchester, this living history farm is complete with an 1856 farm house, vegetable garden and loads of heritage farm animals. Interpretive guides in period costume tell visitors about the tools of the farm and household, and kids get a real kick out of seeing their favorite farm animals up close. A turkey seems much bigger in person - especially when you&apos;re 2 1/2 feet tall. My daughter especially liked the free-ranging geese, and though her favorite book is about lambs, she had no interest in meeting the herd. Columbus Museum of Art&apos;s Wonder Room (free on Sundays) - The Columbus Museum of Art is great for small kids. Almost every gallery in the building has something interesting for young kids, but the Wonder Room is tailor made just for them. From hands-on projects to costumes to dress up in, even toddlers love this spot. It&apos;s a perfect rainy-day activity. Community Garden Campus at Franklin Park Conservatory Not only are these gardens beautiful, but they&apos;re designed in a way that seems perfectly suited for kids to explore. Each garden "room" contains a variety of edible plants - it&apos;s great to show kids from a very young age that food comes from the earth. 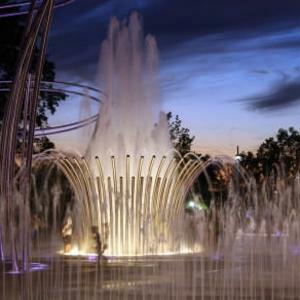 Fountains are of a decorative variety, but are equally entrancing. And of course, you&apos;ll walk away with ideas for your own green spaces at home - even if they&apos;re a few pots in a windowsill. The inside of the Conservatory (ticketed) is well worth a visit, too. The current Blooms and Butterflies exhibit is both beautiful and fun for kids to explore.